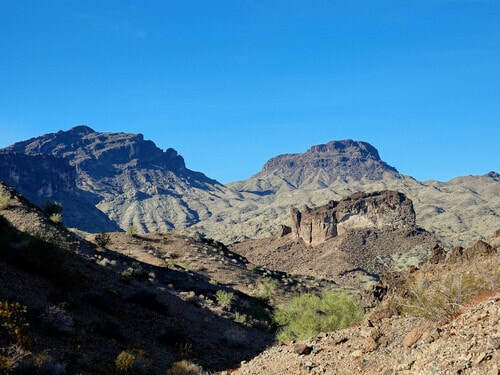 An easy and very enjoyable run through the gorgeous Whipple Mountains and deep Dynamite Canyon. This is one of our favorite trails in this Region. 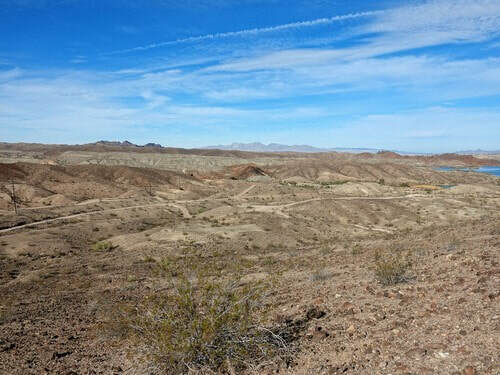 It is an easy run and the scenery is great - Whipple Mountains, Lake Havasu, Lake Havasu City and Dynamite Canyon. 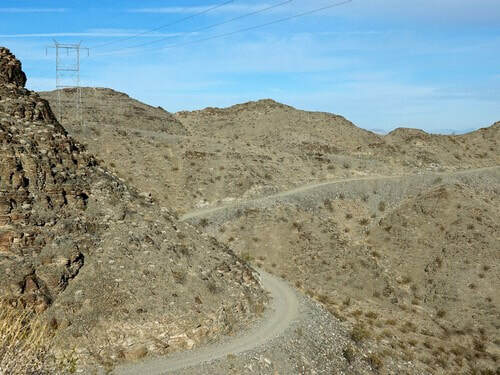 We followed the powerline northwest through the mountains, then dropped down toward Lake Havasu and Havasu Palms. 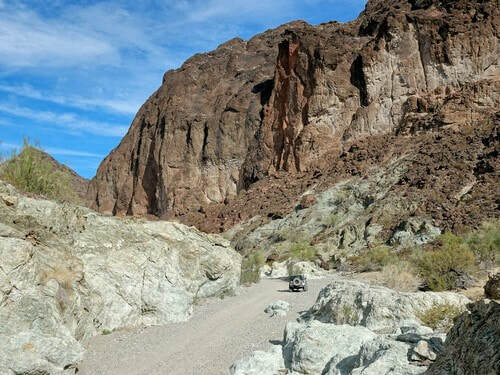 We then went both directions through Dynamite Canyon and finished by exiting southeast on the Havasu Palms Road. There are powerline roads all over the West, but this is one of the best. It winds back and forth along mostly high ground and offers spectacular views of the mountains and the lake. 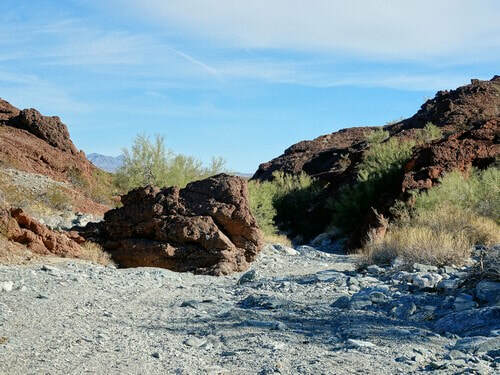 The southwest side of the road forms the boundary of Whipple Mountains Wilderness. 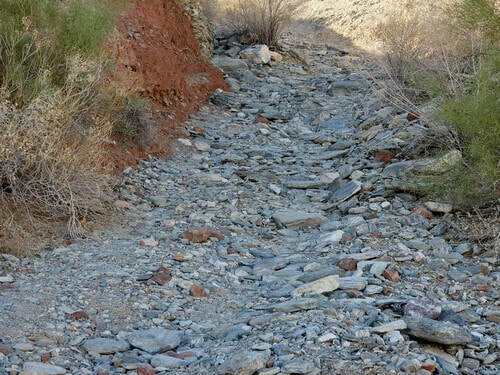 The road was well graded when we visited in December, 2017. The non-wilderness side of the road is nothing to sneeze at. 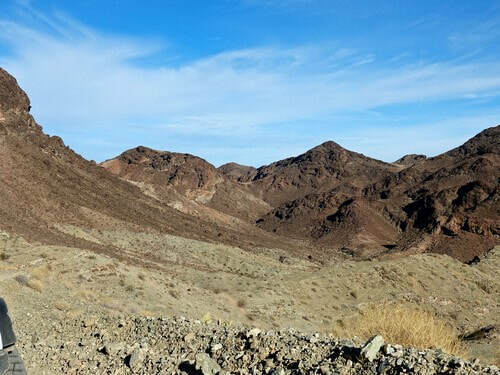 The more rugged mountains are a dark brown contrast to lesser hills. Lesser hills dominate the northwest extent of this trip, but they are also enjoyable. The powerline road drops down off high ground into a wash. 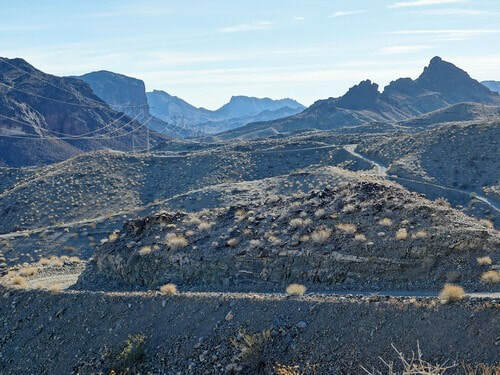 This is where you leave the powerline road and turn down the wash toward Lake Havasu. This is one of the 2.0 rated sections. We did not find a road all the way to the lake. Water from the lake has made for very thick vegetation along the shore. 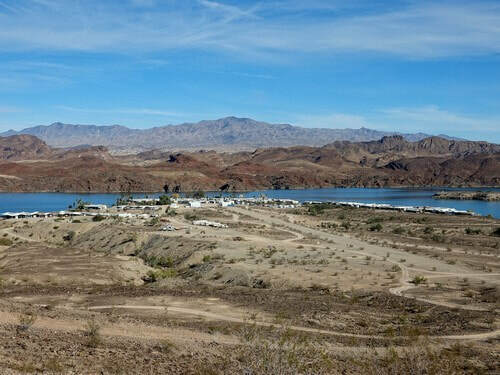 Come out of the wash and follow a series of graded roads up from the lake to an overlook of Havasu Palms. 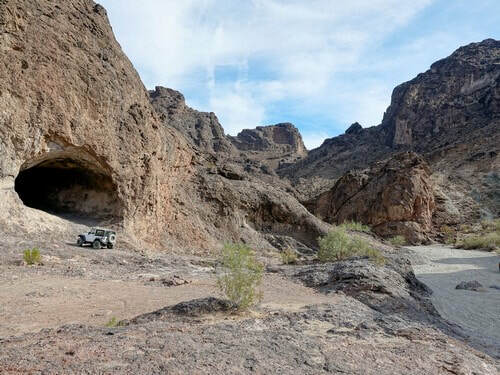 There are trails and roads that lead to Havasu Palms if you want to visit. This track does not go to the community. 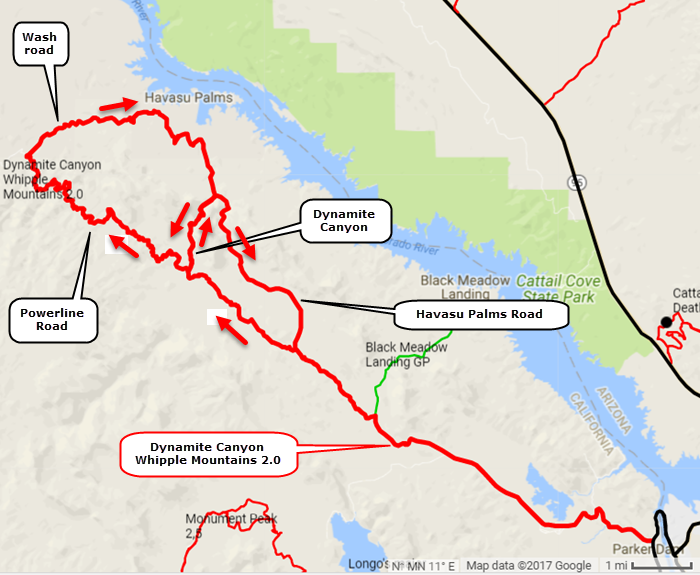 Head for Dynamite Canyon. 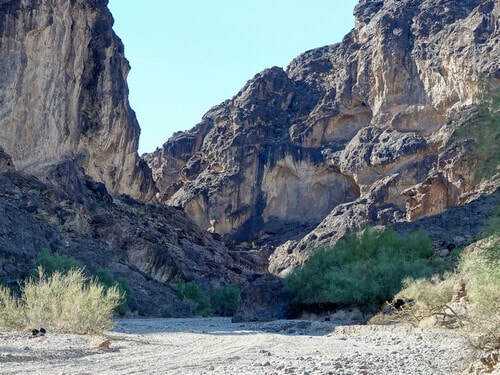 The opening photo shows the approach to it from the Havasu Palms side. Deep and rugged, but not very long. We liked it! Deepest part of Dynamite Canyon. Note the Jeep. We continued south up the same wash to the powerline road we came in on, then turned around and drove back through Dynamite Canyon. White bedrock in the base of the wash was a stark contrast to the dark brown of the canyon walls. The road from the deepest section of the canyon to the road we came in on is the other 2.0 rated part of the trip. 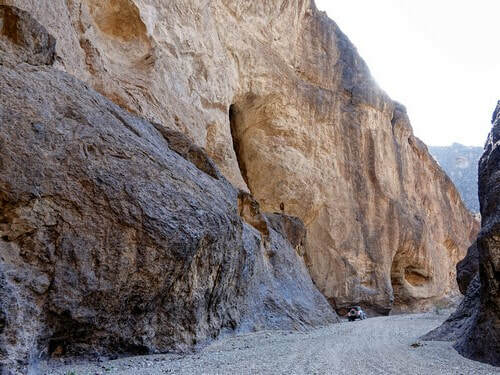 This natural cave can be driven in but we chose not to on this trip. 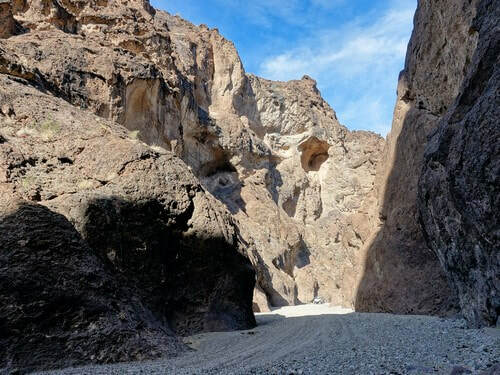 Go back to the north end of Dynamite Canyon and turn southeast on Havasu Palms Road through another canyon. Follow this road to the road you came in on.